Do you keep your bits in a bag? I'm not being cheeky! Just asking about your extra die-cuts, offcuts of pretty paper and images you stamped but didn't use.... This card was made entirely from my bits bag. The Santa was a colour print from a MCS cd and I've added glitter to his fur trim. 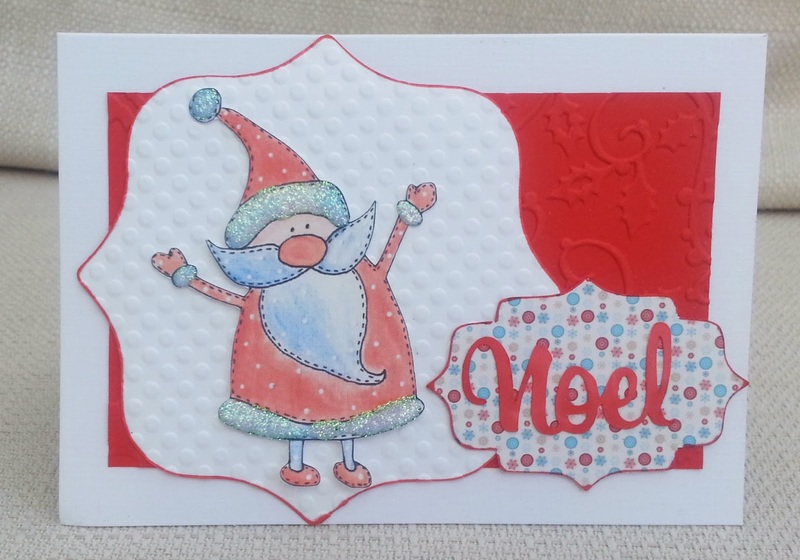 There were two labels ( I added red edges) and a 'noel' die-cut that I've coloured red. I dry embossed the white label and the red panel. So that's five bits gone from the bits bag. Only another 100 to go!! Just to recap, I have challenged myself to make a Christmas card every week , and post it here (to make sure I do it!) . If I do this, by the beginning of December I will have 48 Christmas cards. I have also issued an invitation to anyone who would like to join me. When I saw that this week’s CD Sunday challenge is ‘quotations’, I was stumped initially. None of the quotations that I like seemed to be suitable for a card. But then I remembered this quote from Alice in Wonderland ‘I can’t go back to yesterday because I was a different person then. 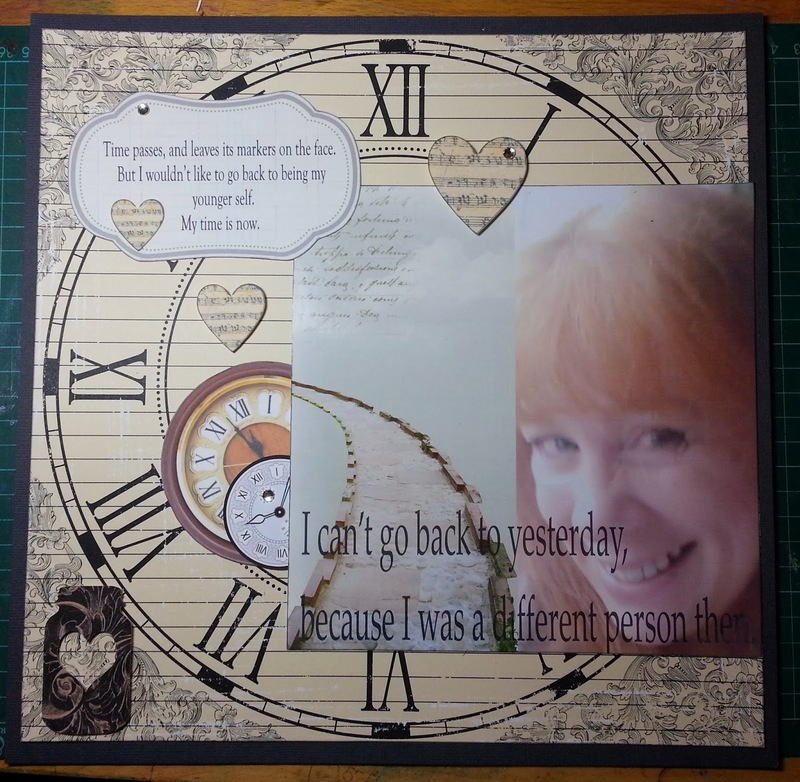 ‘ It gave me an idea for a 12 x 12 scrapbook layout and the person it made me think of was…me! I’ve noticed that in recent photos I’ve started to look a bit (shall we say) ‘tired’. The quote made me think about how I feel about aging. I made a collage in Serif Craft Artist, using a photo of me and elements from Night Garden digitkit (not to be confused with ‘In the Night Garden’, no Iggle Piggle!). I added the quote to the collage and printed it. My background is a sheet of Teresa Collins paper . The two smaller clocks are from My Craft Studio CDs ( Tinkering with Steampunk and Setting the Scene Shop Fronts). 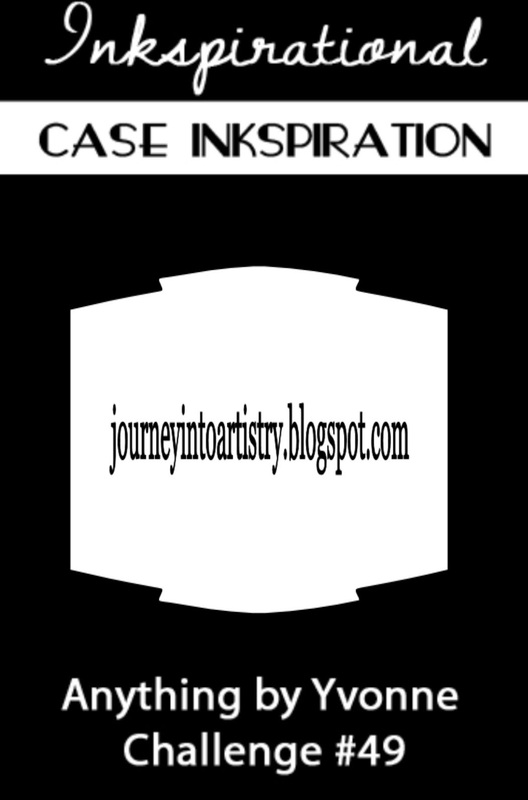 The journalling spot, hearts and jar (bottom left) were cut on my Silhouette Cameo. I've been off work this week, as it's half term, and I've actually managed to get quite a lot of crafting done. Back at work tomorrow so I made the most of it today and got out the melt pot! 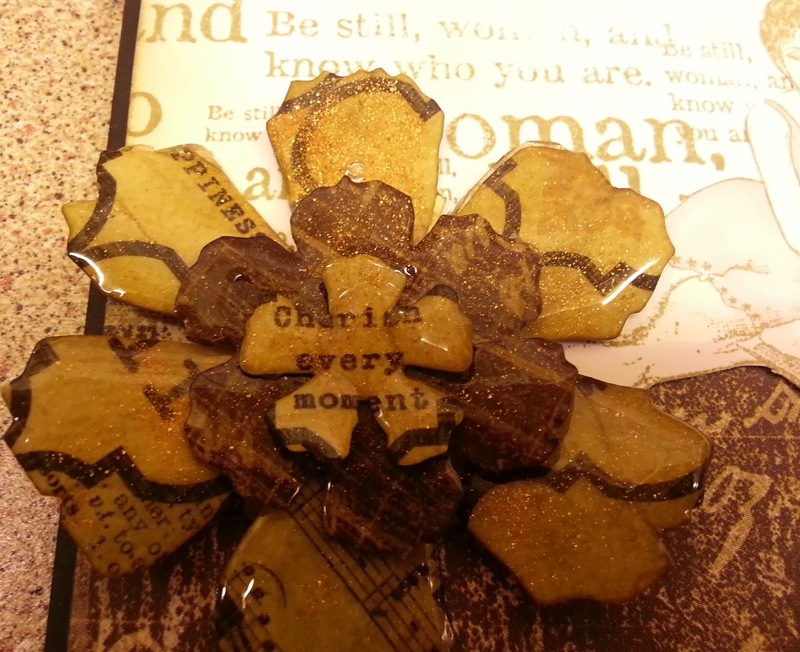 I made the flower with die-cut paper scraps, that I sprinkled with mica and then dipped in the melt pot. I made the butterfly in a mold, using the leftover UTEE. The text background at the top, and the woman are old Non-Sequitur stamps and I cut her out and coloured her with Promarkers. I'm quite pleased with my flower! All the papers here were free with magazines. The dress is an uncoloured image from MCS CD Fab Glam 50s - it was on a mannequin but I cut it out on two patterned papers and 'hung' it on a miniature coat hanger. The tape measure (top right) was from an embossing folder I got for a pound- after embossing I cut it out and inked it. So, a very cheap card! 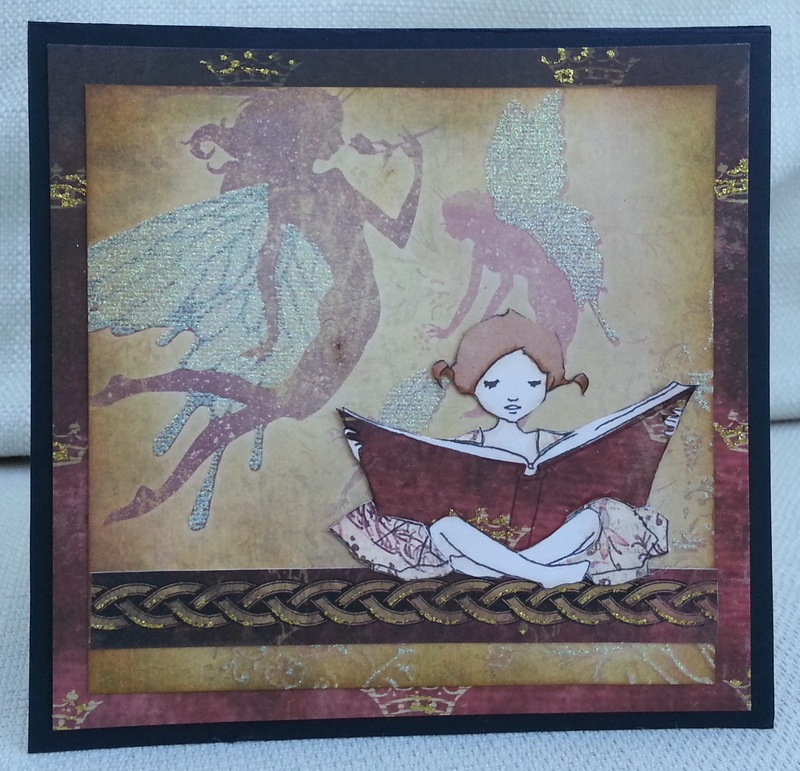 I coloured in the fairy and cut it out very closely. I coloured the chipboard using the paler ink and stamped the woodgrain with the darker ink. I glued the fairy image onto the tag and punched a hole. I put glue on the fairy’s wings and sprinkled them with ultra-fine glittter. I dabbed the whole tag with clear ink , sprinkled it with clear embossing powder and heated it to melt. This was repeated 3 or four times till the surface was glassy smooth. The dabbing of the clear ink caused particles of glitter to be transferred across the tag, which (although not originally intended!) gives the whole tag a fairy sparkle. 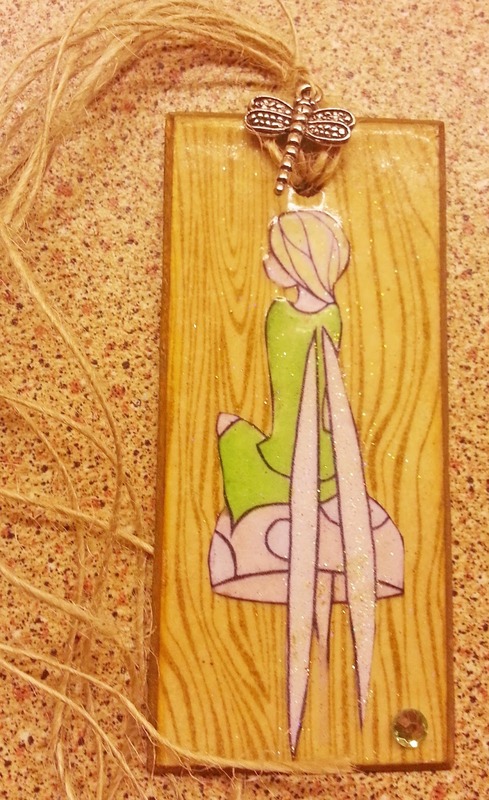 I finished it off with some twine, a dragonfly charm and a gem. Thanks Sami for having me as guest designer. When my sister gave me a gift set of toiletries, she never suspected that, in fact,she had also given me a new home for my spray inks. 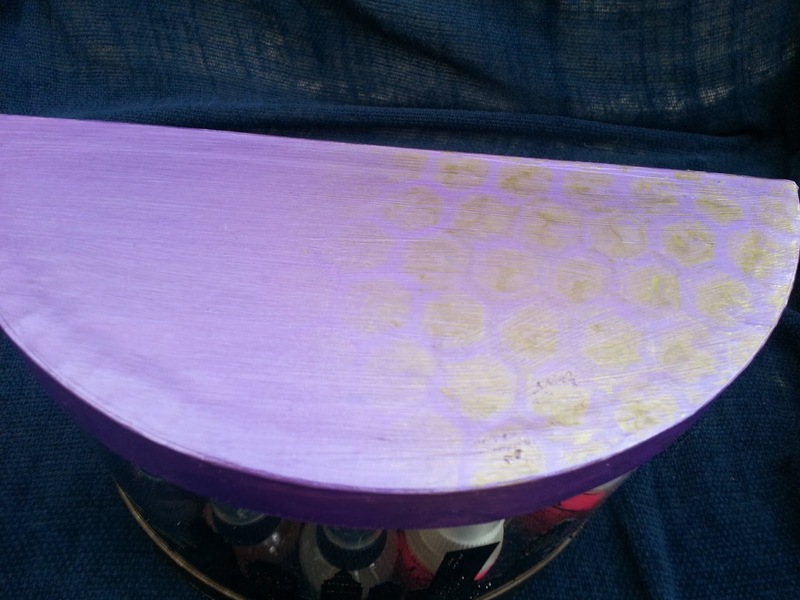 I painted the top and the bottom and added gold ink spray through a honeycomb stencil. 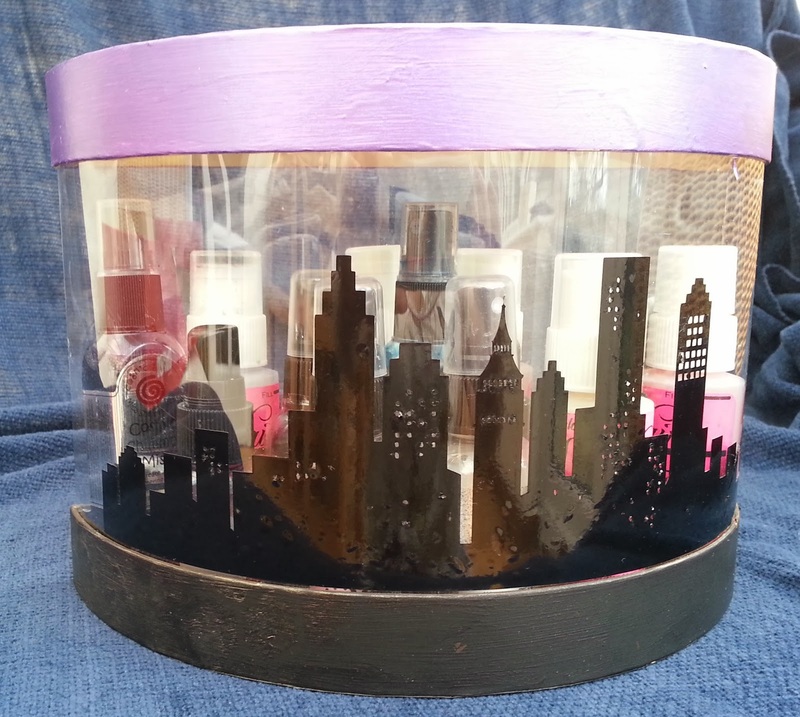 I cut the skyline out of vinyl , using the Silhouette Cameo. It's far from perfect but I like it. 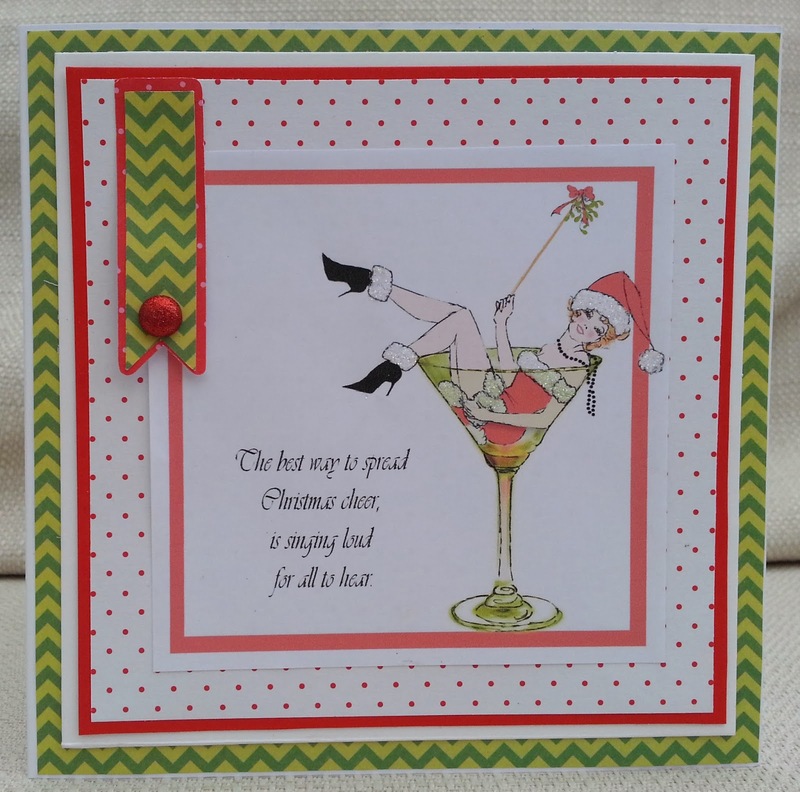 Here is number six of the 48 Christmas cards I intend to have made before Christmas 2014. Chrissie so far has joined me every week. Thanks Chrissie! This week, my image is a pre-coloured one from a Frou Frou CD and I typed in the sentiment . I hope you can see the glitter on her furry bits! The problem with scrapping concerts and shows is that they don't usually allow photos during the performance. So when we took my son to see a tribute to 70s/80s band ELO a few weeks ago, this was the only photo we took. I used a sketch from Skissedilla - where they used a peak of torn paper, I used a triangle and I swapped the photo and the title around. 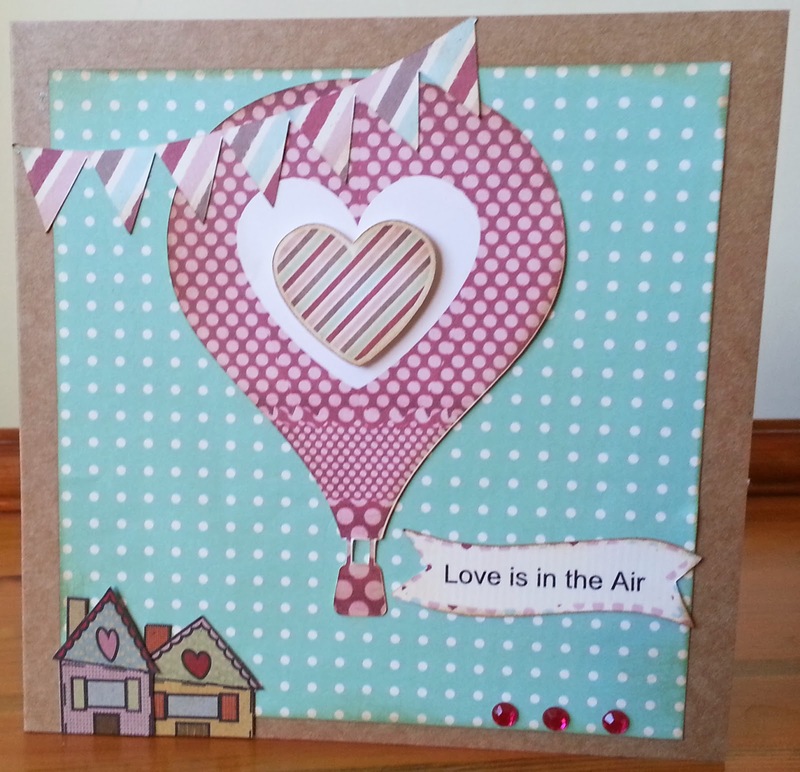 I use papers and sticker etc from Simple Stories 'Say Cheese' collection. The title is after one of the original band's big hits - the 'strange' was made with glittery black thickers. I used lots of ink, stamps, and distressing for a grungy look. Just in case you miss the star of my rubbish photo, I've added a badge pointing to him. A Song in you Heart - Unfinished stongs - I went with the songs theme and the word magic in the lyrics. I've just got back from a very short break in a fantastic hotel in a castle in Sussex. Although many of the fields and some of the castle grounds were flooded (which actually looked spectacular) , many spring flowers were shooting up. This card is for my partner's mother, who enabled us to have our little holiday by having our son to stay. The main image is from Papermania Wellington CD and I brought it into Silhouette Studio, added the text and cut it out in a label shape. I hand cut out two flowers and the tag and stuck them on with 3d foam. I was inspired by the song 'tulips from Amsterdam' and cut the windmill on the Silhouette. The background paper is from a CD called Sunshine and Laughter, which came free with a magazine. I used some Prima papers I got free with a magazine. The yellow birds are from a stamp set that came with the paper pack and the birdhouse is from another magazine freebie. I die cut the doily - the cardstock isn't red as it looks in the photo, but a raspberry pink, and stamped 'thinking of you'. 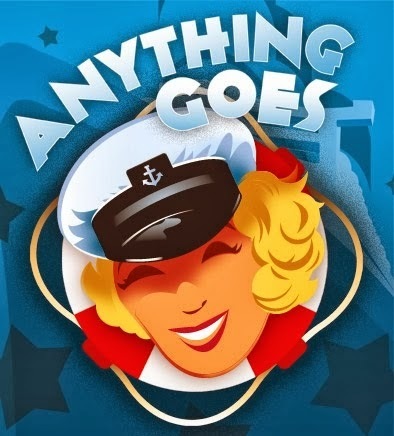 Here's my DT card for this week's Pinspirational Challenge and this week it's everyone's favourite, anything goes. 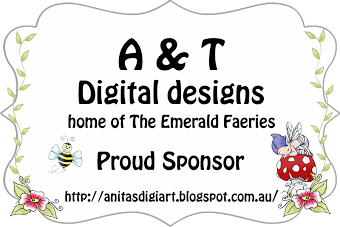 For my card, I used a digi-stamp called 'Pip', kindly supplied by our sponsor A and T Digital Designs. We'd love you to come over to Pinspirational and join in. 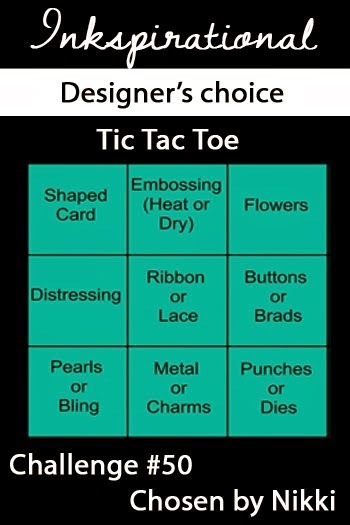 This week we have a Tic Tac Toe (or bingo) board at Inkspirational Challenges . 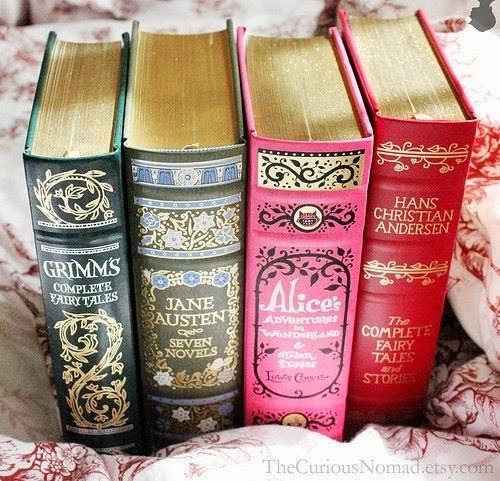 You have to choose 3 in a row and I chose pearls, ribbon or lace (both!) amd flowers. 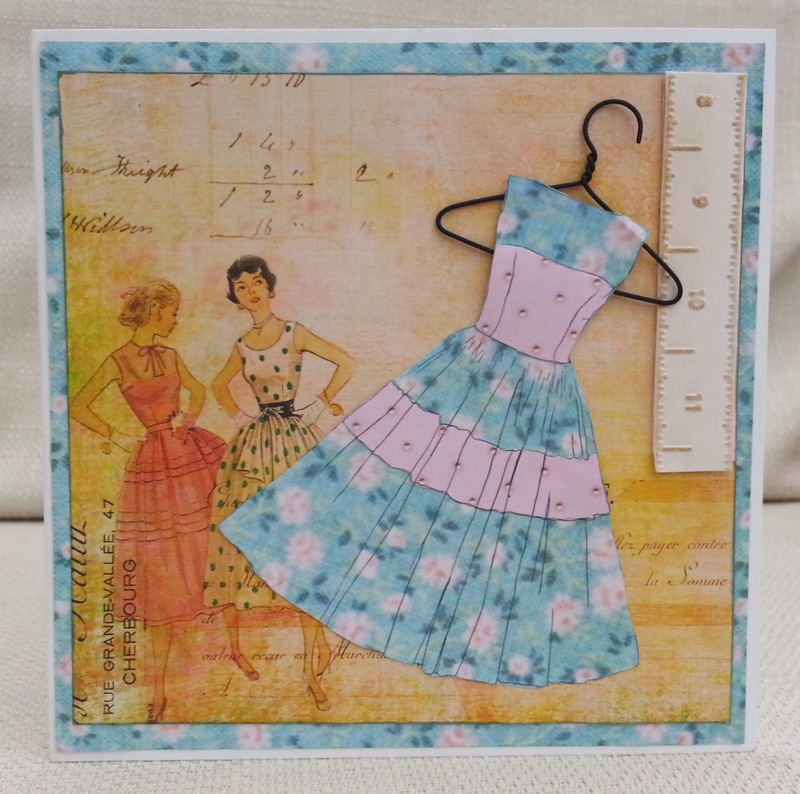 The vintage photo is from Joanna Sheen Fashion CD - my printer is running out of black ink and so it printed with a pink tinge - and I just decided to work with it! 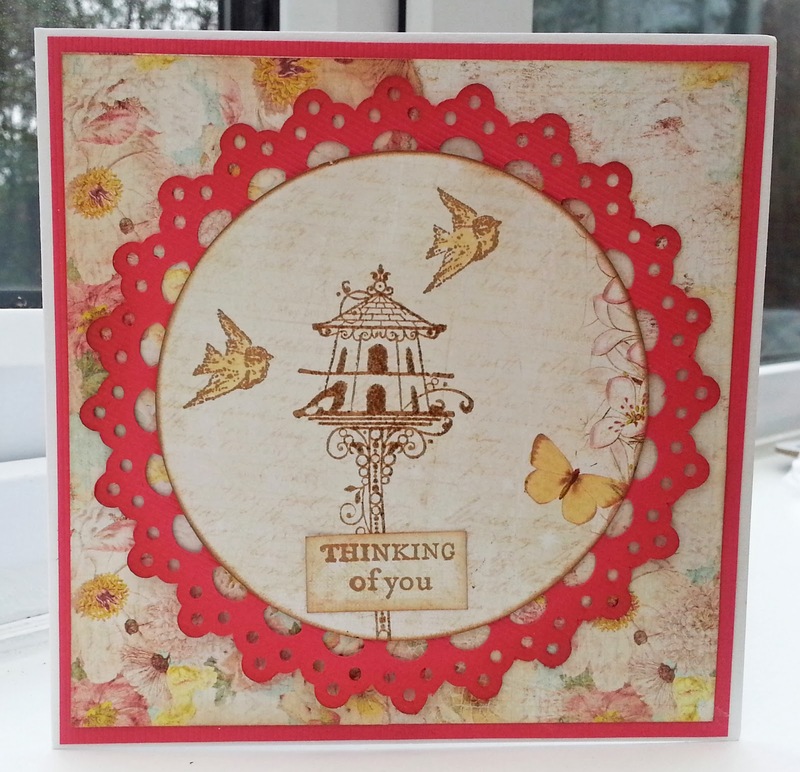 The die cut heart and 'cherish' are Docrafts Vintage Love Notes and I stamped the background with a Penny Black floral stamp. I hope you will pick a line off the board and come over to join us at Inkspirational. I'm keeping up with my plan to get smug for Christmas 2014. 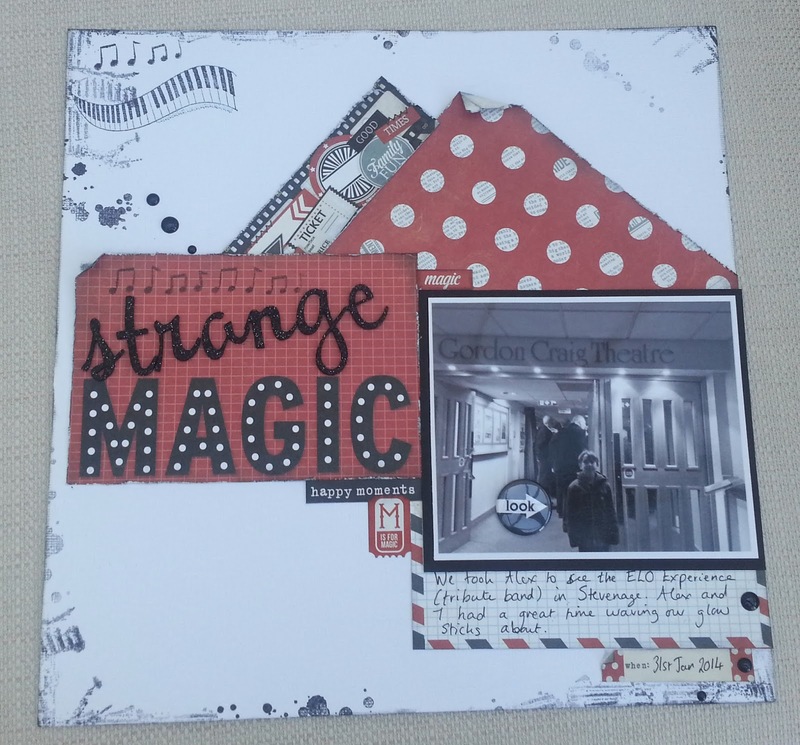 This week, I made a really traditional card using an image from a Debbi Moore CD. It's a great vintage- style image, so I grunged it up a bit by adding distress inks and ragging up the card etc. 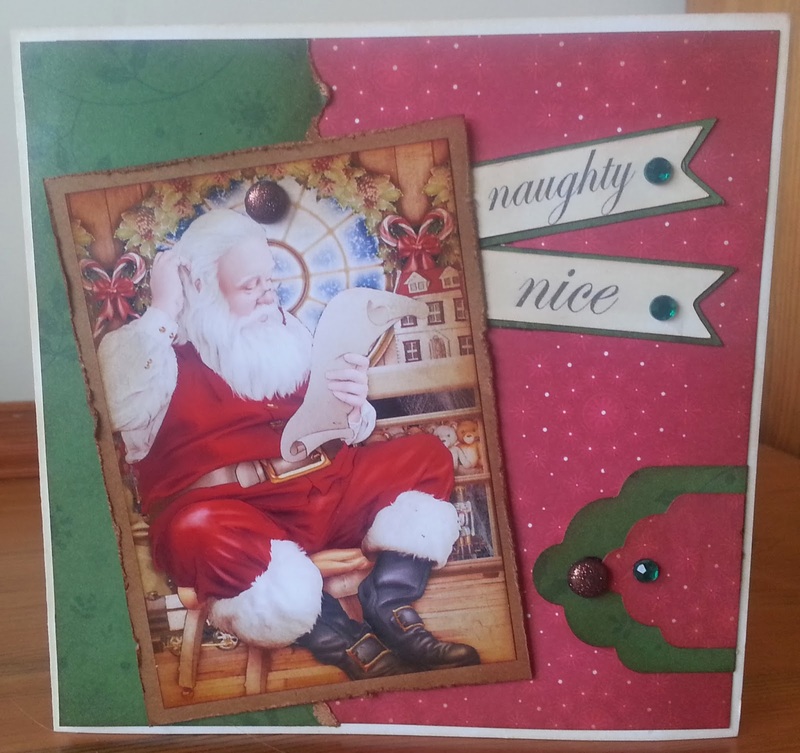 The 'naughty' and 'nice' were printed from my computer and I added gems and glitter brads for a bit of sparkle. 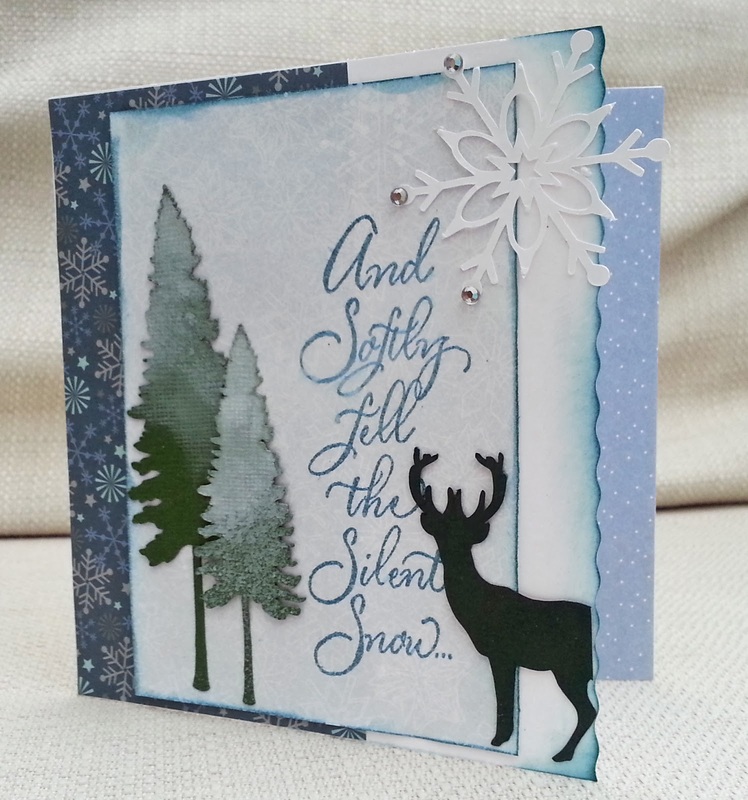 Thank you to those who joined me last week with their beautiful cards - especially Chrissie who is keeping up with me. If you'd like to join me in being well-prepared for Christmas, please link a Christmas card below. This stamp is by Stamping Bella. 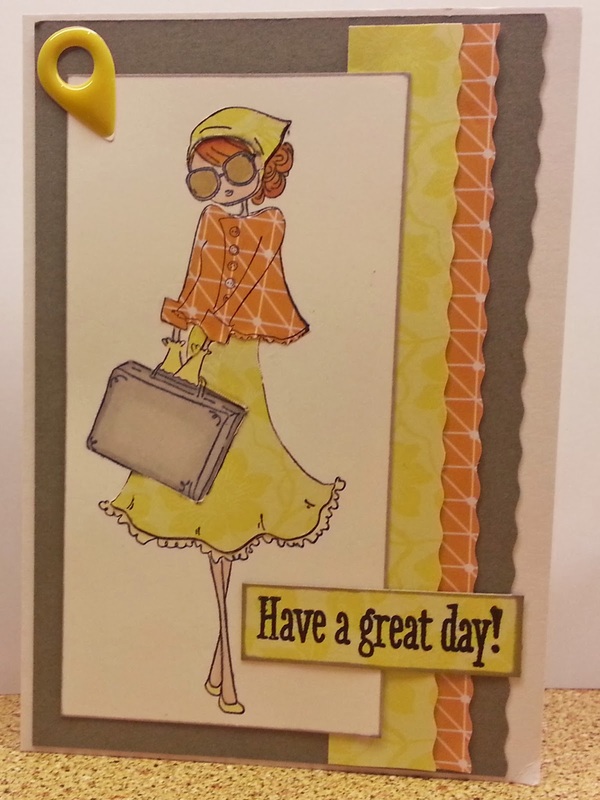 For this card I used random (magazine freebie) patterned papers and a sentiment stamp . The trees, reindeer and snowflake are die cuts and I sprayed everything with white mister. The mist made everything look pale and smudgy but it really wasn't white enough for the snow on the trees, so I sponged white ink as well. I loved the metal angel wings and the tab-shaped sentiment. I hope you will join me this week, and get smug for Christmas 2014. Another Valentine's card. Honestly this doesn't look wonky in real-life, just in the photo. The images are hybrid - most of them are printed and cut on the Cameo, using the 'fill pattern' feature . The sentiment was from a digikit and I offset it, fill patterned it, added text and printed and cut it. The houses are cut from some leftover scrapbook paper . I cut the bottoms off them so it is clear that the spotty paper is the sky! 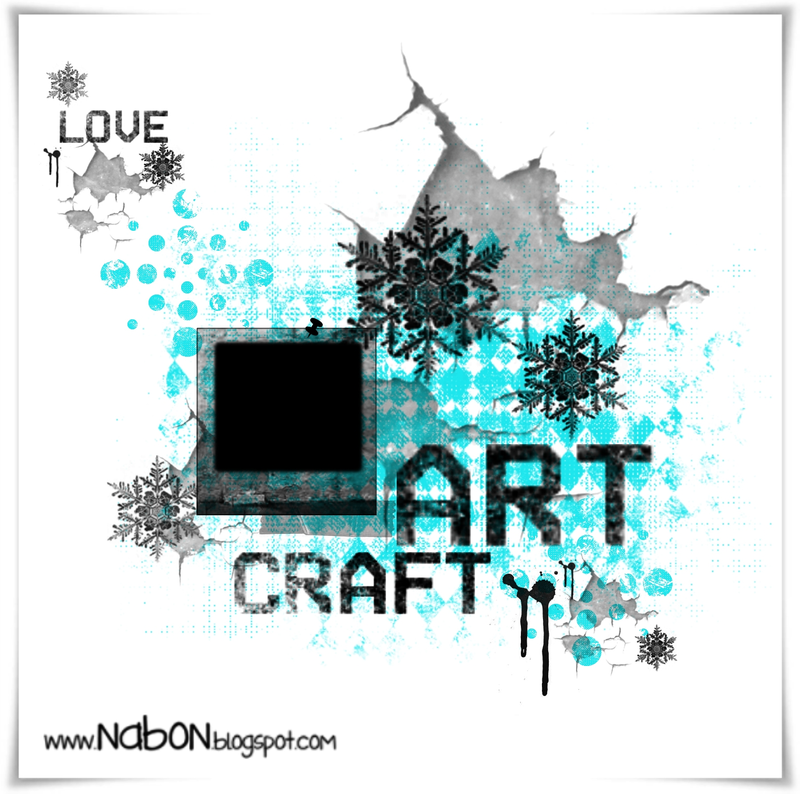 I'm proud to say that this week, I'm a guest designer at City Crafter! 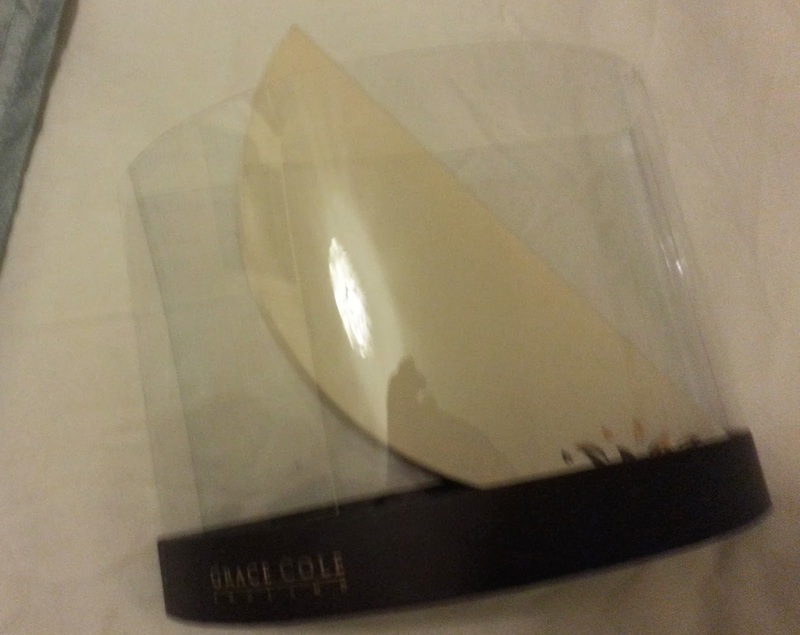 Please pop over to the City Crafter Challenge Blog to see a photo of me (!) , find out about the challenge and see the work of the talented Design Team. 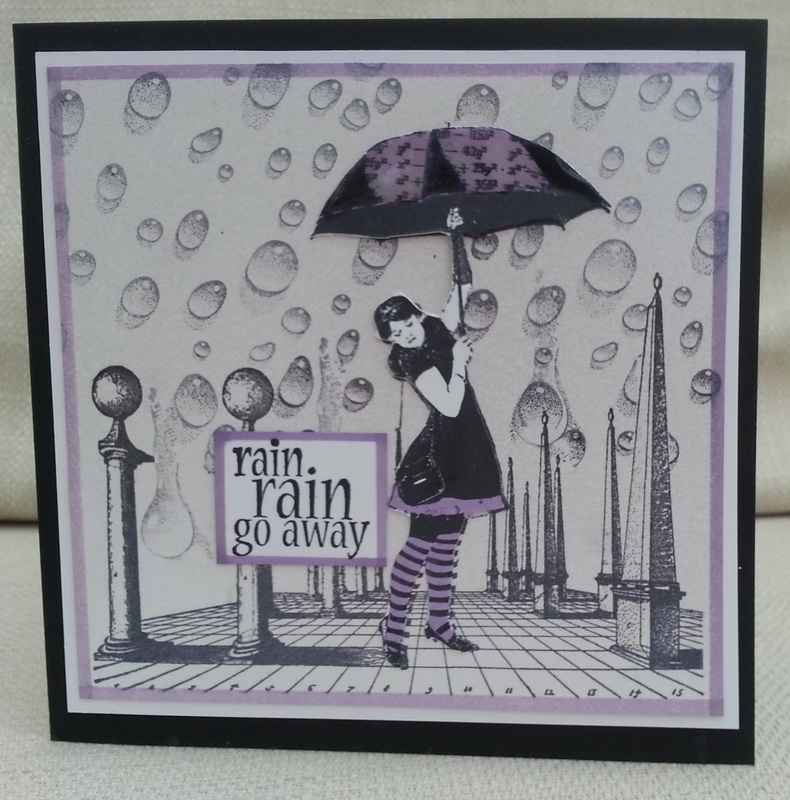 For my card, I used an Art Journey image of a girl with an umbrella. I coloured parts of the image with a purpley colour and then covered the umbrella in glossy accents. 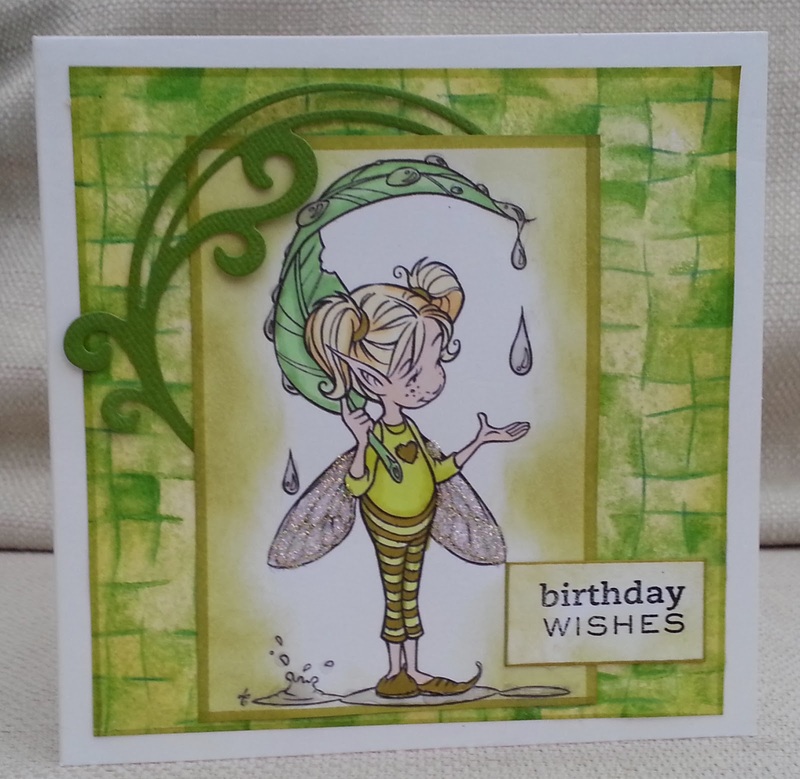 I stamped the background with two different water droplet stamps by Designs by Ryn and a perspective stamp (unknown). 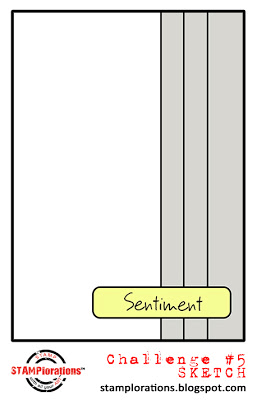 The sentiment is a Unity stamp. 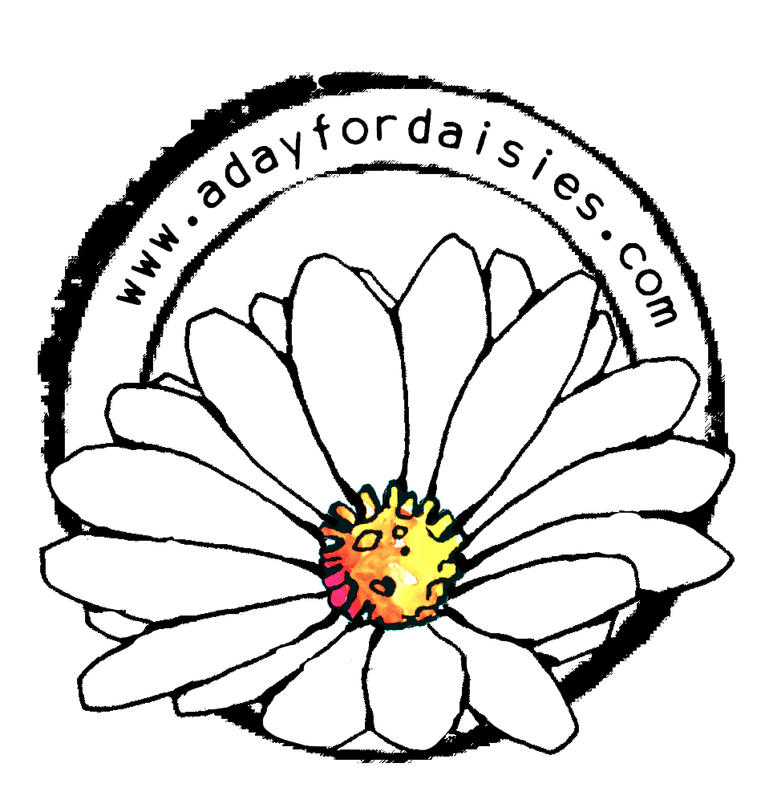 For my DT card I used an image kindly provided by our sponsor A Day for Daisies and a fairytale themed paper stack by DCWV . I paper-pieced the dress and the book cover. Are the fairies in the background just her imagination or have they escaped from the book? 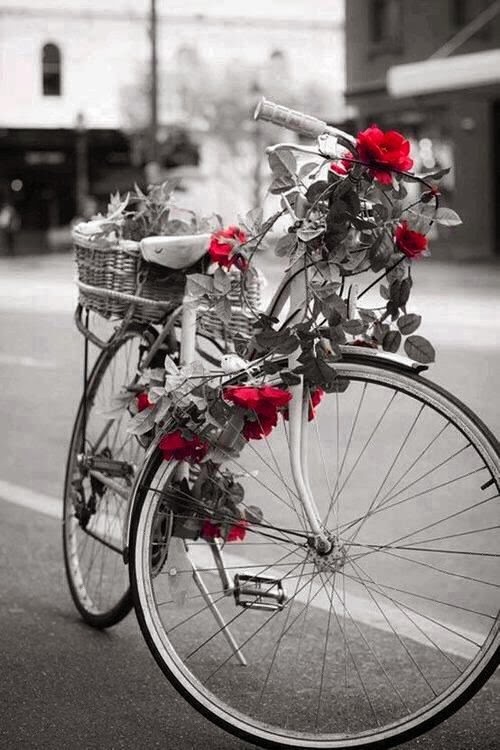 What ideas does this photo give you? Please come and join in at Pinspirational challenges. Sometimes in magazines you see articles on 'ten minute cards'. This card is more like a ten hour card, taking into account the time it took to get my ideas together and then to make them work! It all started with a challenge at Red Carpet Studio - create a project inspired by the morning. I played with a few ideas then settled on the rooster and the alarm clock. But then I had this old song ' I want to wake up with you..' (Boris Gardiner) going round in my head and decided to make it into a Valentine's card. I really do think this is a card to give to someone you are already in a relationship with - if you gave it to the handsome guy at the office, he might be quite alarmed! The papers I used are all from a magazine freebie pack . The rooster was a magazine freebie stamp too and I paper pieced it with two papers. 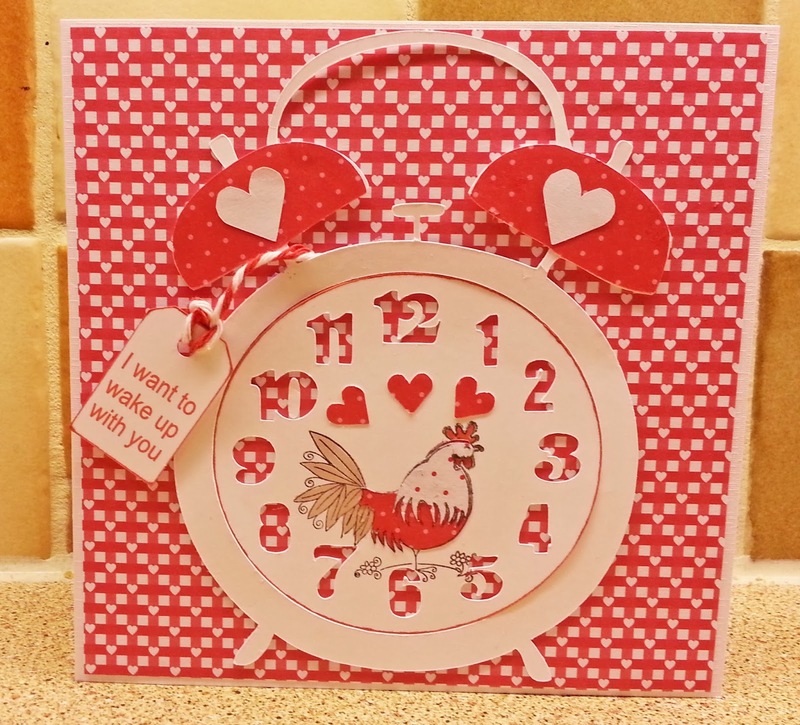 I cut the clock, hearts and tags on the Silhouette Cameo. 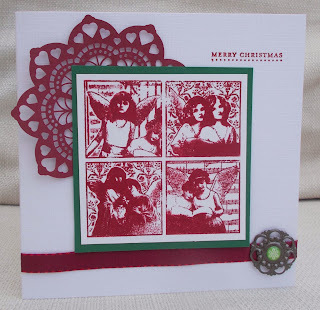 This week at Inkspirational we're challenging you to CASE any card on DT member Yvonne's blog . 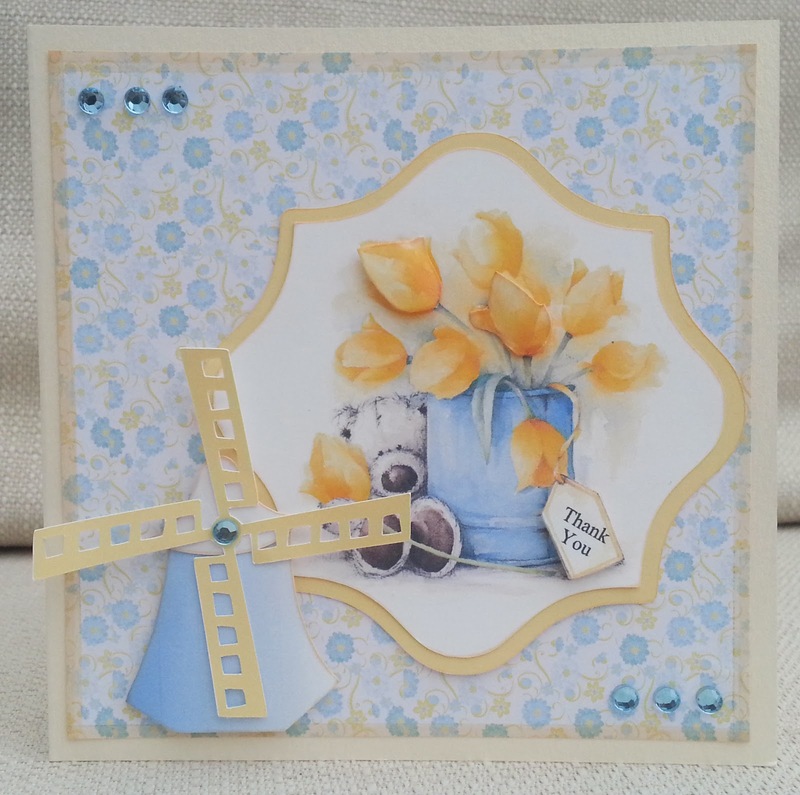 There are so many fantastic cards on Yvonne's blog, Journey into Artistry ,why not pop over there, choose one and join in? For more ideas, please visit the other DT members' blogs.